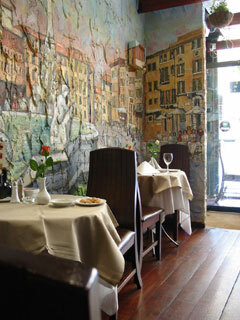 Tastefully decorated Il Borgo, successfully creates a true impression of Italy in the heart of London. The minute you walk through the door, you are stunned with the classic Italian wall paintings that cover the whole restaurant. This has been combined with an excellent use of plants, hanging baskets and the beautifully illustrated ceiling, to create a calm and relaxing ambience. Located close to the Gloucester Road station, Il Borgo is a perfect venue for all occasions, being a romantic dinner at night, a business lunch, or a party in the private dining area at the back of the restaurant. The menu offers something for everyone with a blend of traditional and modern Italian cooking. The chef uses only the freshest ingredients to create a range of mouth-watering meat and fish dishes with specialities such as roast duck breast in strawberry sauce. Seafood is also a speciality here, and you will often find, fresh sea bass, Dover sole, monkfish and halibut on the ever-changing specials menu. The vegetarians will also be spoilt for choice, especially as many Italian dishes make scarce use of meat and can easily be adapted to vegetarians’ likings. Having established a reputation for quality and service, the restaurant is frequently visited by celebrities. Advanced bookings are highly recommended. The finely balanced menu offers a selection of cuisines to suit all diners, with an attractive selection of meat, seafood and vegetarian dishes. All food is cooked to order and from fresh ingredients with serious considerations given to healthy, wholesome eating.